• Product information sessions at our newly designed Training and Presentation Centre in Toronto. • Printed materials including our Burial Vault Selection Guide and custom packages designed for pre-need funeral professionals. • Custom designed and installed Vault Displays created to take the guess work out of vault presentations. 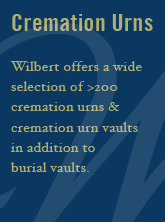 • We stock a beautiful collection of Wilbert Urns and Jewellery and can provide you with an effective Urn Display.